The Riverview Manor team spent days leading up to Halloween and the big day itself engaging residents and staff members in all things that go along with the spookiest time of year. 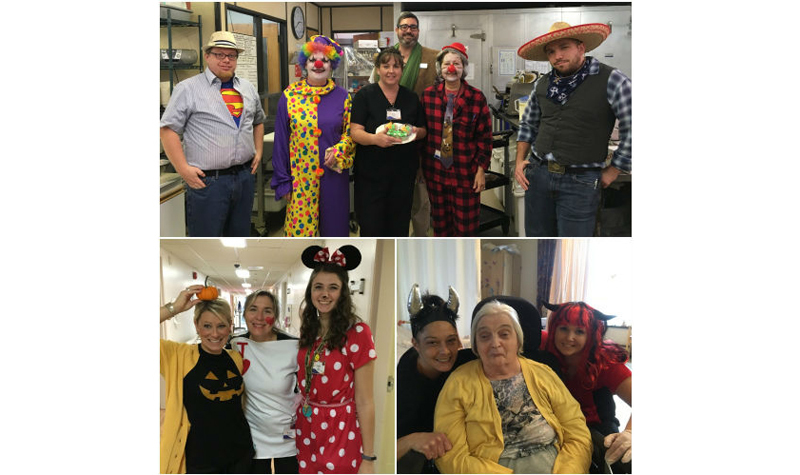 From Oct. 29 to Oct. 31, the Peterborough long-term care home hosted dress-up days for residents and staff members. To encourage participation, staff could wear costumes, Halloween scrubs or Halloween colours to work. “Many participated and we saw costumes like witches, scarecrows, pumpkins, a raccoon, Darth Vader, a Jedi Knight, superheroes, the Bride of Frankenstein, two team members dressed as Wednesday Addams, and there was even an electrical outlet,” Riverview Manor environmental services manager Crystal Post tells The OMNIway. On Halloween, the managers put together a table of treats in the nursing office for team members to enjoy. One team member brought her children in dressed as witches to pass out treats to staff and visit with the residents, “which was a big hit,” Crystal adds. Riverview Manor also hosted a pumpkin-carving competition on Wednesday, and the event saw participation from all departments. Prizes for the scariest, most original, funniest and fan-favourite pumpkins were awarded. “The competition was held after bingo, and the residents were the judges who clapped for their favourite pumpkin and helped us determine the winners,” Crystal says. Personal support worker (PSW) Rose Supranes received the award for the scariest pumpkin. Rose carved a large eye in her pumpkin and had small pumpkins all around it and on top of it. The award for most original pumpkin went to PSW Jan Edwards, who had carved flamed eyes and a mouth in her pumpkin. Funniest pumpkin design went to dietitian Bre Drury, who made her pumpkin into Humpty Dumpty after he fell off the wall. Fan-favourite pumpkin design went to life enrichment aide Tina Hutchinson, who carved Minnie Mouse into hers; she had the residents help her as part of a Halloween activity.